Choose A Shell And Find Out Who You Are! Relax, close your eyes, breathe deeply and imagine that you are on the beach. 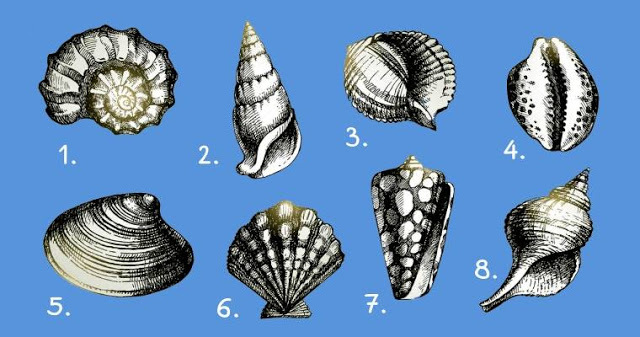 Now look at the picture and choose one shell that you like most. 1. You are a very kind person, but you can not tell others "no", causing harm to yourself. Making decisions always remember to think about their consequences. 2. You are a person with a sharp and clear mind. You will always achieve your goals. You are lucky. You can expect good news. 3. You are always at the center of attention. You charge others with your energy, which attracts people to you. You are kind and sensual and love life. 4. You are a communicative person and, you like to be among people. You spend a lot of time with friends and colleagues. 5. You are hard working person, so career growth is assured. Goals are easy to achieve for you. You know how to focus and make a lot of effort to translate ideas into reality. 6. You spend a lot of time with your family. You can find your rest only at home. Perhaps you are fond of painting or writing poetry. In any case, you are a creative person, but generally, you are a homebody. 7. You easily cope with problems. In a crisis, friends look for your understanding and support, ask for advice. You are intelligent and practical, extremely compassionate and kind. 8. You think too much about the little things. You constantly criticize even what is not worth attention at all. Try to change your attitude to the world, look at life positively, and others will appreciate it.